My question is very similar to this previous post. I'm searching for the right distribution family to use in a GAM. My data are disease occurrence on benthic organisms (continuous response variable) and are right skewed (see histogram below). I would like to test the relationship between disease occurrence and percentage cover (continuous covariable) including the effect of Site (fixed categorical) and Zone (random, nested within Site). I don't have many zeros, and these are true zeros, therefore I don't think a zero-inflated model would be the most appropriate. So my question is: which would be the most appropriate distribution family to use? Any advice would be highly appreciated, thanks! Browse other questions tagged r distributions skewness gam or ask your own question. How to decide which glm family to use? 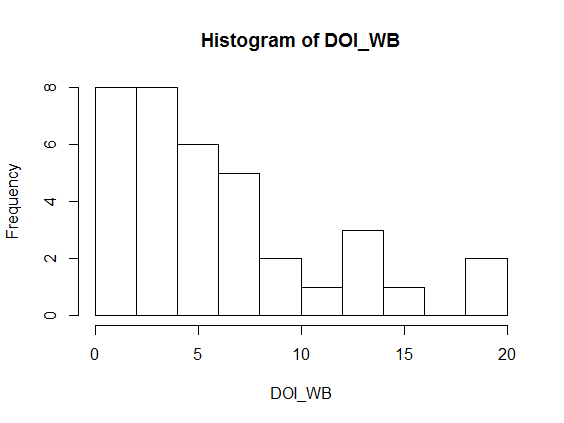 How to run unbalanced two factor nested design in R? How to analyze right skewed data with a continuous DV? In linear regression, data is highly skewed, transformation doesn't work..!